We recently did something at Cosco we very rarely do. We bought the huge can of Nacho Queso cheese sauce. It instantly became a game to figure out how many different ways we could use cheese sauce. It started with cheese dip and chips, but quickly became cheesy-bean and 7-layer dips. 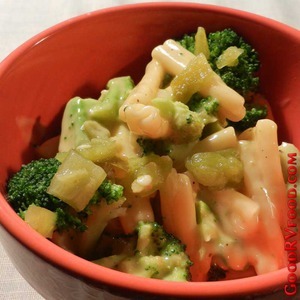 Then broccoli and cheese or simply macaroni and cheese. These last two were combined to make this easy and rich tasting recipe. Fortunately it works just as well with the small jar of queso cheese sauce found at any grocery store. You can use any shaped pasta you like and any style queso sauce. Personally I would avoid skinny pasta, like spaghetti, but if that is all you have in your RV pantry go for it. Pace makes a good queso dip but it is hard for me to find. Use as much or little cheese sauce as you like. I heard someone once said at a Pampered Chef party - There is no such thing as too much cheese. 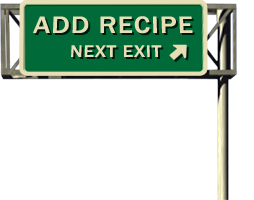 Adjust whatever you like to make this recipe your own. Cook pasta according to package directions. While the pasta is cooking microwave or steam the broccoli and chop into bite sized pieces. When the pasta is done, drain and immediately return to the pan over medium heat. Add chopped broccoli, queso cheese sauce and gently stir until the cheese sauce is softened, warm and completely coating the pasta. If you like it a little spicy add a can of roasted green chiles.